Target: There is no net loss of the extent, and an improvement in the ecological processes and environmental values, of natural wetlands. Reports on anthropogenic pressures on wetland values and the state of wetland environmental values for natural freshwater floodplain wetlands in the Great Barrier Reef catchment as at 2016. 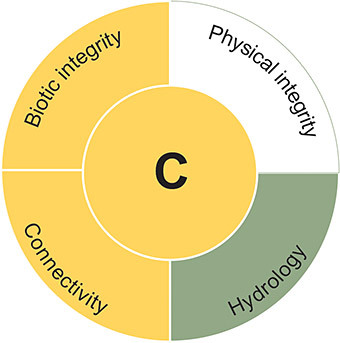 Overall, wetland environmental values of freshwater floodplain wetlands in the Great Barrier Reef catchments are rated as moderate in terms of both pressure and current state. Wetlands surrounded by non-conservation land uses have higher levels of anthropogenic pressure resulting in greater levels of disturbance to wetland environmental values. Wetland condition assessment is a new program that reports on wetland environmental values every four years. Reporting for 2016 provides a baseline condition assessment that future progress will be compared to. 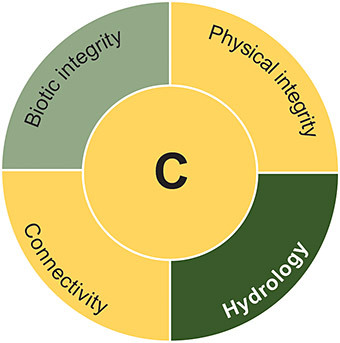 Biotic integrity: condition of the wetland’s naturally occurring ecosystems. Physical integrity: integrity of the wetland’s natural physical landform. Hydrology: naturalness of water movements and wet-dry cycle of the wetland. Connectivity: connection of the wetland to other natural ecosystems. Read the detailed Wetland condition results (PDF, 1.8MB) and methods (PDF, 1.8MB) .